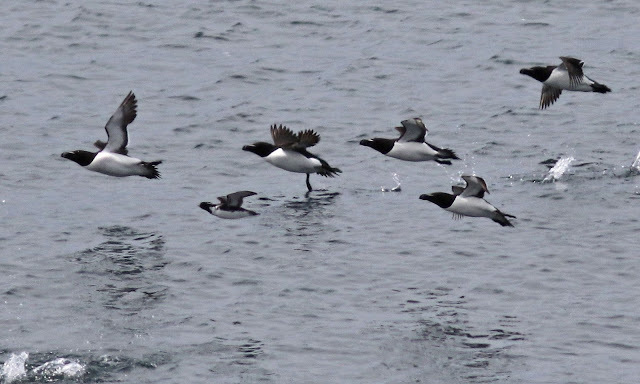 I was down there on the 13th and found an Ancient Murrelet amongst the razorbills, this is a pacific species most of whom nest on the Aleutians I have read. 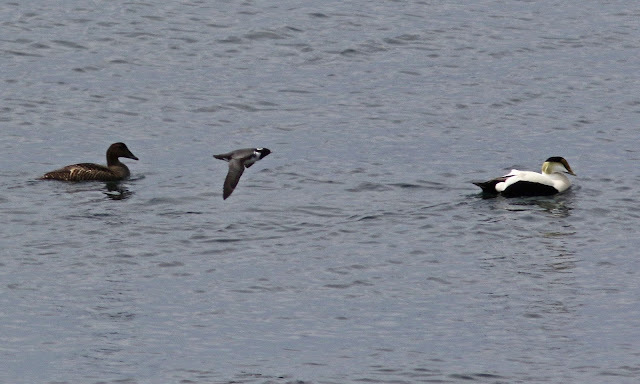 This bird was keen to engage the razorbills and looked somewhat like a young razorbill alongside its parent. A lovely little fowl it were with the appearance of an earnest aquatic quail. Seeing such a rare bird makes me wonder how many such wonders have seen me that I have not seen. and Inspires me to look those rafts of alcids over a bit more carefully. The overall message here is that Seal Island is a wicked half decent place to go Birding. I have heard rumor that this bird was seen at Petit Manan @ 45 miles ENE of Seal. The tropic bird took a few years to realize that Seal Island was the place you want to be, so I expect that after a bit more exploring this Murrelet will reach the same conclusion.